Q-Tee Tapping Saddle - CASCADE PLC - The new home of Cascade Clamps UK Ltd, Suppliers and Manufacturers of pipe fittings to the water & gas industry. The Q-Tee Tapping Saddle is ideal for creating service connections and for hot tapping into the main. Its design makes it simple to install as it sits perfectly on the pipe, two lugs hold one side of the straps firmly in place allowing the user to bend the straps round the pipe into the adjacent lugs. The Q-Tee also has a flow isolation system already built in allowing a blade to slide in between two seals between the base and the start of the neck, stopping the flow of water. 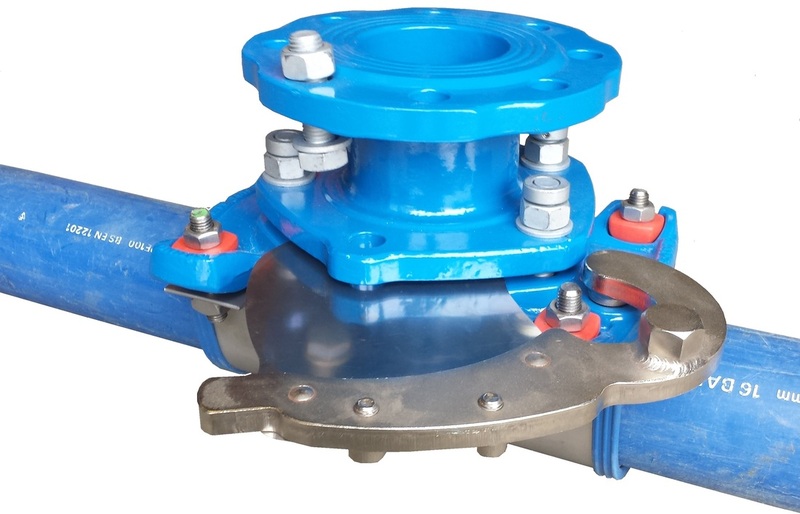 This system means that there is no longer a requirement for tapping through a valve as the Q-Tee is a a Valve and a Under Pressure Tee in one, saving money, installation time and space. Please see our downloadable E-Brochure for more information on application and specifications. For our Slimline Q-Tee Saddle click the button below.